Finally, a simple and stylish rear rack designed for road bikes without braze-on mounts or threaded dropouts. Axiom's Streamliner Road DLX Rear Rack has an arm that attaches to the rear brake caliper mounting bolt and legs that mount using your wheel's existing quick-release skewer. Other thoughtful details, like feet that set the rack 4cm behind the axle for great heel clearance on frames with short chainstays, make this an excellent pick to add some carrying capacity to your road bike. Narrow profile for added aerodynamics when loaded; keeping the load close to the center also increases stability. Made from hand-welded 10.2mm tubular 6061-T6 aluminum construction for strength and durability. Fits 700c wheels with fenders. 510 grams (1.12 lbs). Black. Product does not support advertised weight limits. I took this rack for a spin on a short overnight tour of about 90 miles, and as I was staying in a hotel, I only used the right pannier. It seemed to function ok. I just got back from a tour down the California coast (6 days) and the rack broke at the start of the 5th day (about 240 miles in). I had two panniers on, with a total combined weight of less than 25 lbs. The product is advertised as supporting 50 kgs. The piece that broke was the L shaped metal attachment from the front of the rack which gets bolted to the part of the frame that houses the rear brake. Luckily I had some washing line with me and I was able to tie the remaining part of the L shaped attachment over the top of the bike frame. The rack might be ok for carrying a laptop to work, but it's not suitable even for light touring. (The one caveat I have is that I didn't attached the metal piece behind the brake caliper. As I have a touring bike with cantilever brakes, I just bolted it to the bike frame where a traditional rim brake would attach with a bolt and appropriately sized washers. I don't see why this would make any difference, but just wanted to point that out). TL,DR This rack is PERFECT under the following conditions your bike doesn't have traditional rack mounting points (ie race bikes), your panniers release from the top, you don't want a trunk. The lower mounts on this are my favorite thing about this rack. They move it back far enough that I don't get ANY interference with my heels, even with very large touring panniers. This rack is quite a bit lighter than the two previous ones that I tried and it is still sturdy enough to carry everything for a four day tour. As every rack should, it has a place to properly mount a tail-light. Some of the benefits of this rack design can also be deficits. If you need to reach the back of your panniers to release them it can be tough since the rack is so narrow. This narrowness also makes it incompatible with every trunk known to man. I use this bike rack every time I ride, whether it is for carrying groceries or other items I have purchase, carrying recycling I find, or just carrying spare tubes and tools to change them. I find the design perfect (slim) for a road bike. It is also very sturdy because of the attachment to the brake calipers and frame. When coupled with the market pannier bags I purchase, I have found NOTHING that I can not carry. I have had 3 or 4 people examine and make positive comments on the rack and have been asked where I got it and I tell them. The axiom rack is great! 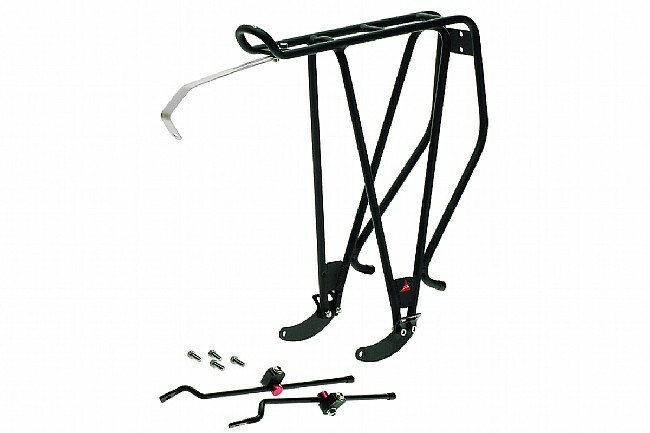 The axiom road rack is lightweight, easy to install and has great clearance. It works great on my road bike. I am using Vaude touring bags with it. Highly recommend the Axiom rack. PERFECT RACK FOR MY ROAD BIKE TO GRAVEL BIKE CONVERSION!! This is the perfect rack for my conversion from road bike to gravel bike. My old Giant OCR carbon road bike doesn't bring rack mounts, and Axiom's design allows this rack to fit using the rear skewer, and rear brake caliper mount, brilliant! I received many complements from other cyclists on this sleek rack, and after some very minor adjustment, it carried my large panniers perfectly for the ride across Missouri ! Have a road bike with a carbon frame. Using it to commute to work and needed some capacity to carry essentials. Perfect. Slim and functional. Fits on my Lynskey Helix Sport with 28 cm road bike. Its a little narrow when connecting to the rear axel but works. Fits two bags and has plenty of room for heels. Not sure I'd put more than 40 lbs on the rack but that would be beyond my needs. Top of rack narrows nicely and makes it slimmer compared to standard rear racks. Still wide enough to fit standard road fenders with 700x38 tires under. Sturdy and effective for light pannier use. Used for daily commute duty. Great rack. Sits on bike nicely and holds pannier secure. Nice lines. Use to place panniers on for multi day bicycle rides. I have this product attached to my cadd 8 rhode bike and could not be any happier. I don't ride competitive so i mostly use my bike for local trips to town. Im able to put huge saddle bags on the back and fill those bags to my hearts desire at the local farmers market.The clearnce is great and the rack holds up with a good amount of weight. I strongly recommend this rack to anyone who owns a rhode bike and is looking for a rack. Very streamlined and quality rack. Installs easily and quickly. Receive compliments from bike nerds often about how streamlined and tucked in the design is. Fits my orblieb paniers perfectly. Looks great and very strong. Streamlined and narrow design matches road bike perfectly. Not a bulky wide rack. Fits my ortlieb bags perfectly...and fits tight against rear triangle. Came with all necessary hardware. Lightweight, high quality, easy install without rack mounts. I purchased this for my wife's new road bike that does not have rack mounts (braze-ons). It is very lightweight and sturdy. The narrow deck width looks very sporty and aerodynamic for a lightweight bike. It is best for mounting panniers to, not strapping things to the deck itself. For the price, it is hard to beat this great rack. We originally bought this to accommodate the husband's Ortlieb briefcase bag. The bag is incredibly wide, and this rack was the only one that could be set back far enough to avoid heel strike. Unfortunately, the whole setup moved his center of gravity too much and made the bike unstable. I gave it 4 stars because it's specifically not made for touring bikes which have rack bosses and a longer wheelbase, so the center of gravity problem is likely to happen for a lot of people using this with a road bike and setting it as far back as it will go. But if you avoid this pitfall, as we have by getting a narrower bag and moving the rack a bit closer, it is otherwise well-designed. Installation was a snap, the rack feels sturdy, and the design allows for lots of different bag attachment points. Overall I think it's a great rack for the price.